Today Canada is a great place to take up a career. It has designated employer immigration streams which make it simple to find a job and obtain work permit. There are streams like the Global Skills Strategy and other streams of the Atlantic Immigration Pilot Program. Having a job offer from a designated employer is necessary to reach Canada through a designated employer stream. These are companies which receive recognition by the federal government/provinces for hiring overseas workers. Furthermore, there are several employers who cannot fill up open jobs by hiring qualified workers in Canada. Such immigration streams permit fast processing and issuing work permits. The reason is that these programs do not require a Labor Market Impact Assessment. Work permits also do not take much time for processing under these programs. This also means that a candidate can Migrate to Canada and start working in a matter of two weeks. The Atlantic Immigration Pilot Program aims to attract fresh applicants to four Atlantic Provinces of New Brunswick, Nova Scotia, Newfoundland and Labrador, and Prince Edward Island of Canada. This immigration program has three streams which target high and intermediate skilled workers as well as international graduates of educational institutions located in Atlantic Provinces. The Designated employers offer jobs to candidates and also match them with settlement agencies of the region. The candidates in turn can apply for Canadian Permanent Residency. Moreover, there is no requirement of an L.M.I.A. in this stream. It offers a streamlined pathway to obtain permanent residency in Canada. The Atlantic Provinces needs labor seriously which makes it vital to fill up jobs quickly. People who apply for PR through the Atlantic Pilot Program are even eligible to get a temporary work permit if they suit the needs of an immediate position. The Canadian government launched the Global Skills Strategy a year ago. There are instances where the government issues a work permit within two weeks. This program has the Global Talent Stream for temporary overseas workers and divides eligible employers into two categories. These are based on in-demand occupations and employer referral to the Federal Government through the recognized economic development authority. 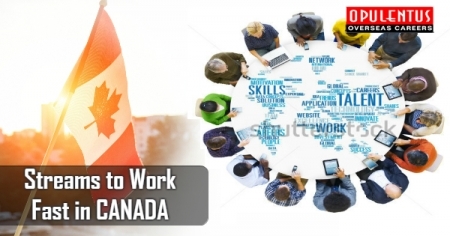 This Strategy is of great help to Canada to boost the domestic technology sector by permitting companies to employ overseas workers with sufficient expertise and experience. Industry experts feel that this program will offer a competitive edge to the country in the global technology market. A designated employer immigration stream serves as a great option for reaching Canada. Candidates can find one which suits their qualifications. They need to read regarding the requirements of the streams and realize their dreams.